CompareToOptimize is a sneaky advertising-supported application that might enter your system without your permission. This program is distributed via InstallerRex installers mainly; however, it might still enter the system via Amonetize and Vittalia installers as well. Thus, it is not surprising if you feel like CompareToOptimize has appeared out of nowhere. It does not really matter how it has managed to do that because it is still advisable to delete it as soon as possible. If it happens that you decide to keep it, you should know that it will not help you to save money while shopping online because this undesirable program just seeks to drive traffic to particular websites and advertise particular products. As you can see, this adware will not act in a beneficial way, which is why we recommend that you delete CompareToOptimize from your PC. The manual removal instructions provided below the article will help you to do that. If you have CompareToOptimize adware on your system, there are no doubts that you will see various in-text, interstitial, and pop-up ads. Commercial advertisements are no very harmful themselves; however, there is a possibility that you will be taken to untrustworthy websites if you keep clicking on them. Keep in mind that these websites might contain malicious software, which means that it is rather risky to click on any of the ads placed by CompareToOptimize. The specialists of pcthreat.com claim that the presence of ads is not the only drawback of CompareToOptimize. They have found out that this unwanted program might do other suspicious activities, for instance, collect information associated with your activities on the web and connect to the internet without permission. 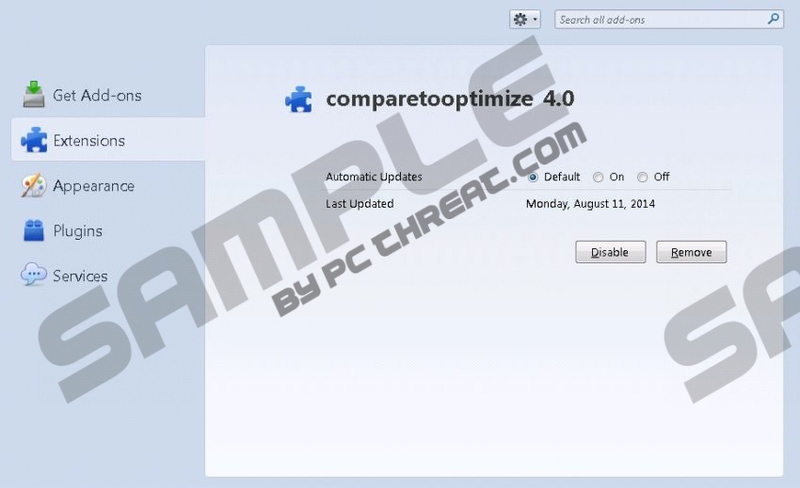 If you want to browse the web without any interruptions, you should get rid of CompareToOptimize as soon as possible. The easiest way to do that is to scan the system with SpyHunter or any other reliable antimalware tool. Just make sure that the tool is completely reliable. Click on the application that you wish to remove. Select Uninstall to delete it. Quick & tested solution for CompareToOptimize removal.